Search Engine Optimizations Tips | SEO Tools and Tips | SEO Services in Chennai: iGoogle to retire in November, 2012! 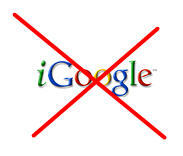 Google has decided to discontinue iGoogle from 1 November, 2012. The search engine giant earlier announced about closing down of its several services as part of its spring cleaning in summer program. iGoogle, that allow users to add features like news, weather, mail and many other was once Google's fastest growing product. The official reason provided over the announcement is that, "with modern apps that run on platforms like Chrome and Android, the need for iGoogle has eroded over time". However, it has also been announced by Google that it will shut Google Mini later this month. The search engine giant has already shut Google Talk Chatback recommending people to use Meebo instead. Google videos stopped storing videos in 2009. It will allow to move the already present Google videos of users to YouTube till 20 August, 2012. Google will soon discontinue Symbian Search application.